It has been a fairly slow weekend but, regardless, we have been working on the site! We have fully integrated Twitter into the site, visible with the widget on your right hand side (our Twitter username is “theilife”). Also, we have setup an AIM account for anyone wanting to contact us (again, our screen name is “theilife). Lastly we are proud to announce that we have another writer for theiLife.com. Our third Matt on staff, Matt Hamilton will now be writing for us on a weekly basis- so start looking for his work coming soon! We hope you enjoy these enhancements and have a happy Sunday! Early Monday morning, Sidney and I awoke with only a few hours of sleep from coding late into the night. We had to be reminded what was happening in this confused state- “today is Macworld!” We quickly got dressed, packed our bags and headed out the door. We knew that we weren’t coming back that night- Tuesday morning was the keynote and we had every intention to be first on line. Once we got to Moscone West, we were met with a different line wrapping up and around both 4th street and Howard. We quickly found our place and began to wait- which was quick and relatively painless. Once inside and with registration finally sorted out, Sidney and I split up- he went outside and started the line, while I went to my AppleScript workshop (PJ). I would leave every hour or two to go and check up on him, to let him take a break (and return his electronics that were charging). Up until about 6 o’clock, with my workshop long over, I stayed inside and charged all our gadgets one last time. By about 6:30, I was getting kicked out so I left and began to wait with Sidney (and the slowly growing group). Look out for Part II later today, I have to catch up on some sleep now! 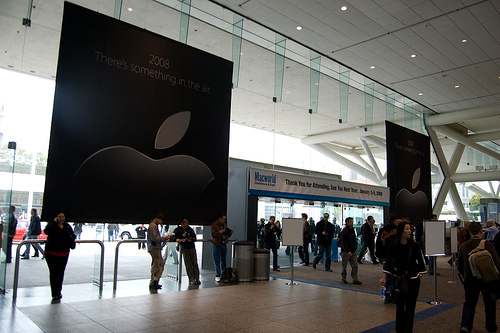 After a very intensive week, with memories fresh, is time to reflect upon Macworld. 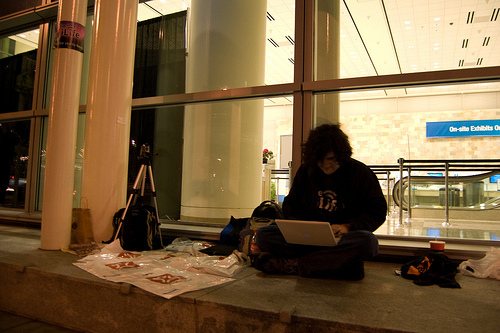 This was my first Macworld, I actually won a Super Pass through the Mac Observer! 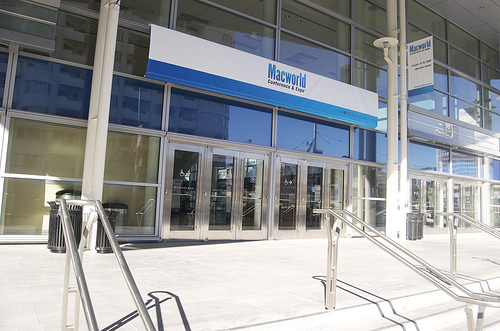 The entire Macworld experience was amazing! It was the first time I was surrounded with people who are as obsessed with Apple as me not to mention, meet all the developers whose products I use everyday. 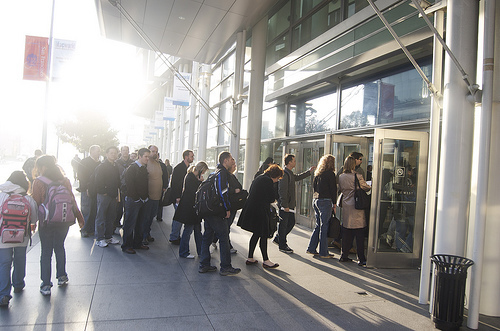 When we arrived to Moscone West Monday morning, we were met with a large, yet orginized line wrapping around the Moscone Center- very unlike other lines we’ve seen in New York City. The line was quick and painless and once inside I printed my badge from Axiotron, which is another story within itself. Once inside and registered, we split up- Sidney went to start the keynote line, and I went to my AppleScript workshop. Durring my lunch break, I visited Sidney and let him use the facilites and eat food. You can read more about our line experiences here. The workshop was interesting, and I also got a chance to peek around to the other workshops as well. After Monday, however, I didn’t get much time to go to my workshops and conferences because between waiting on line for the Keynote, the Keynote itself, and the show floor, there was no time to spare! Now with some free time, I can sit and reflect upon the past week- so expect a number of articles about the many events. You should also start seeing all the interviews we conducted, coming up over the next week as well. 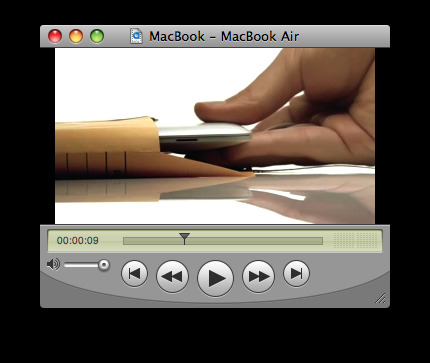 Joining the “Boom” Macworld video, “Expo”, is the recap of the actual Macworld Expo. It comes from hours of footage obtained while on the show floor over the past week. This will be the last recap type video from Macworld, we are working on uploading all of the interviews with exhibitors shortly. Again, apologies for the lack of High Quality, our Hotels internet connection doesn’t allow for fast uploads. 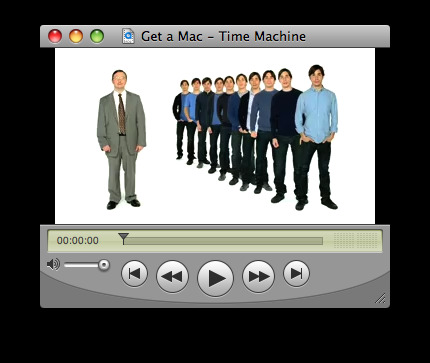 Last week, Apple posted the latest installment of the Get a Mac series, about Time Machine. We have later learned that it coincides with the release of Time Capsule. It has now been published to The Daily iLife podcast, which you can subscribe to in iTunes or watch here. 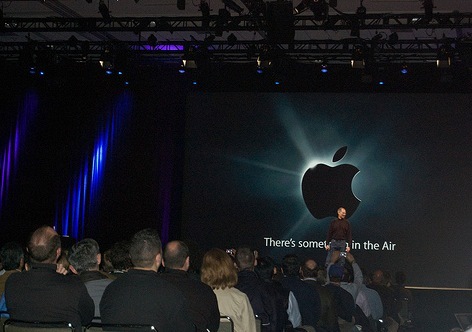 In the typical introduction of Mac and PC, instead of there being one Mac, there is a line of 10. PC is shocked, so the various Macs explain that it is simply “Time Machine,” a feature in Leopard which makes regular backups of the hard drive. PC is forced to admit that such a feature is “pretty awesome,” followed by thanks from the various Macs.